Ross won the prestigous award for best director at the Jules Verne Adventure Film festival in Paris for his film narrated by David Attenborough entitled ‘HUMPBACKS FROM FIRE TO ICE’. Buzz Aldrin famed astronaut was scheduled to present him the award in Paris but Ross had a previous engagement in Peru filming Gulliver Media’s ‘LOGGERHEADS THE LOST YEARS’ and was unfortunately unable to meet his child hood hero. 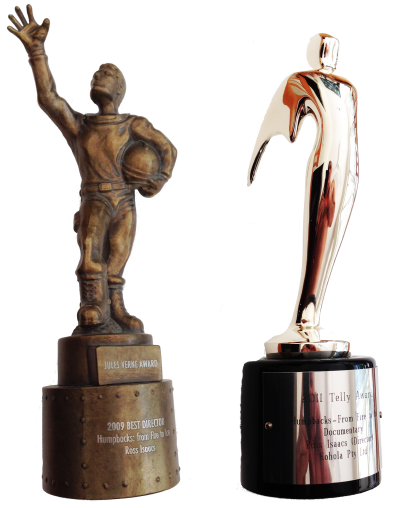 We also received the prestigous TELLY award in Los Angeles for best documentary and editing for ‘HUMPBACKS FROM FIRE TO ICE’.